How are you all holding up friends? I hope all is well wherever you are! Over here it been busier that ever. Work has been, well, work. Hopefully I haven’t accumulated any more white hairs than I already have over it, because really, I honestly don’t think I am blessed to be one of those people who pull off white hair with elegance and panache. As it is, it’s been 38 years and I am still trying to pull off my regular hair with elegance and panache! The Christmas rush is also upon us. At least over here where Christmas season starts on September 1. I haven’t even begun to think about that. Christmas decor is out in full force every corner I turn, but ours are still tucked cozily away, blissfully unaware that they are late for the party. This will be rectified soon. When? I can’t promise that, but soon. And the Christmas shopping! Oh boy, the Christmas shopping. Another thing that is slow out of the gates. I’ve resolved, however, to try my utmost to maintain calm and enjoy this season, despite how crazy it gets over here (if you have never experienced Christmas in the Philippines I can’t even begin to describe the level of crazy). It is after all the season of joy, love, and, just as if not more importantly, of hope. And that is something I can absolutely get behind (even if I’m not quite into carols in September, bling-bling decorations, and mass spending in a 3rd world country). – Place the oil and sugar in the bowl of an electric mixer fitted with a whisk attachment and whisk to combine. Add the eggs and vanilla and mix well until combined. – In a separate bowl, combine the cocoa, flour, baking soda, and salt with a wire whisk. Whisk until everything is well combined. Gradually add the dry ingredients to the egg mixture. Stir until just combined. – Chill the mixture in the refrigerator for an hour or until the dough is firm enough to handle (mine took a lot longer than an hour). – Place confectioner’s sugar in a shallow bowl or plate. When the dough is firm enough, shape into 3/4 inch balls. Roll in confectioner’s sugar until completely coated. – Place balls on a parchment-lined cookie sheet, spacing them 2 inches apart. – Bake in a pre-heated 350F oven until puffy and cracked on top, about 8 – 10 minutes. The cookies will still look underdone and have a soft center. – Set the pan on a wire rack to cool completely. Once cool you can sprinkle with more confectioner’s sugar if you’d like. These aren’t the domed topped chocolate crinkles that I grew up knowing. They baked quite flat. The batter is very runny, and even after many hours of chilling in the fridge, is was still not firm enough to handle. I think next time I’ll leave the batter in the fridge overnight and see if that makes a difference. What I did for this batch is scooped bits of batter out by the teaspoonful, dropped it into the confectioner’s sugar, and formed it into a ball between two tablespoons, while coating it in the sugar. The batter still spread tremendously so make sure you do not use any more that a teaspoonful, or as the recipe dictates, about a 3/4 inch ball. Despite their flat appearance the cookies have soft, chewy, chocolate-y centers with crisp edges. Still a good chocolate cookie! And the Christmas shopping? I’ve decided that this year I am only going to buy presents from small local businesses and self-employed people. We have loads of talented artisans and producers out there who deserve our support! Or I may be making some gifts myself 🙂 We will see. If you have suggestions of small local businesses whose products would make nice presents please feel free to share in the comments! P.S. The tree will be up this week…by hook or by crook…with or without ornaments…I hope! Wonderful cookies! That is something I really like. I am also into baking cookies lately… oatmeal choco-chip to be specific! I've baked 2 batches in 1 week already, hahaha… good idea for holiday gifts too I guess. can i just lessen the amount of sugar mentioned in this recipe? Sep is EARLY! My Dad starts playing Chrissy songs at the end of Oct (argh), and the main shopping areas in SG are all decked out already… trying to ignore until December actually begins! that is where I go to view all sorts of food related things from many different bloggers. Cheers! 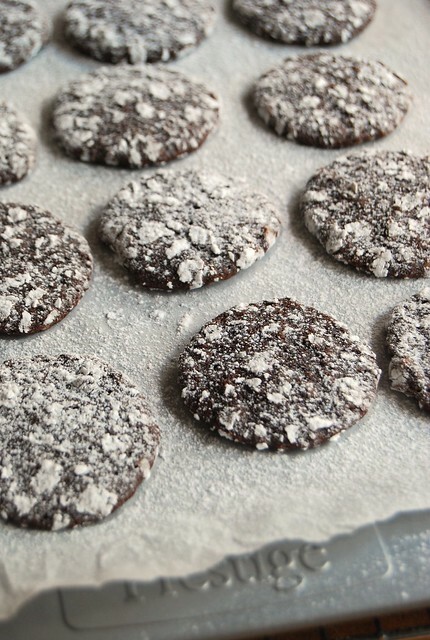 Ooooh…I miss chocolate crinkles. When I was in school, we use to buy these at recess time or lunch time (as dessert)! This cookie reminds me of the Philippines, and of course, Christmas time – the season of crinkles galore! O dear.. yes Christmas season is sooon, very soon! I only just started thinking about it and our plans for the holidays… Love these chocolate crinkles! Hi Mom-Friday! This is such a childhood classic 🙂 Gotta try those oatmeal cookies soon! Hi Ling! They really start early here…it is major! I love what Christmas stands for but I think it has become a bit too spending-centric here…ironic for a 3rd world country! I sure gonna try these out. Looking really really love those cookies of yours! Christmas fevers starts in November in Rome, but we made out christmas tree 5 days ago!